MOTO-GORI was founded in Italy by Giancarlo Gori in the early seventies. The models consisted of off-road machines. 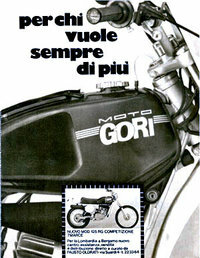 In 1978, Signor Sironi of SWM motorcycles bought half interest of MOTO-GORI. Moto was dropped from Gori, and was now know as Gori motorcycles. It was interesting to see that Mr. Sironi was part owner of two motorcycle companies at the same time. What is also interesting, was that the GORI competition models were powered by SWM tuned engines. These models were green in color similar to the Kawasaki KX. The GORI brand disappeared around the same time as SWM. 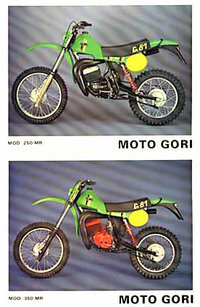 Gori was mainly known for its off-road bikes, but also produced children's models and a couple of very sporting 125s- a pukka racer and a super sports roadster. The racer, which used a specially tuned Sachs six-speed unit, was particularly successful in hill-climb events, with Guido Valli becoming italian hill-climb champion in 1974 and 1975 on his 125 Gori. The company also offered a customer version of this machine. Its specifications included: 123.6cc (54x54mm), 13:1 compression ratio, 34mm Bing carb, Motoplat ignition, Marzocchi suspension, 170mm Fontana front brake and was capable of 185 km/h (113 mph). Maximum power was 24.8 bhp at 11,000 rpm. 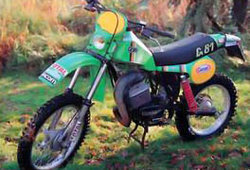 Gori also produced a small number of the 125cc Sport Valli Replica during 1975-76. This used the same (very slightly detuned) six-speed Sachs engine, but had a full fairing, twin front discs, cast alloy wheels and sharp styling. Although barely road legal it was at the time the quickest 125cc street bike in Italy, with a claimed maximum of 92 mph. The Rotax motors used in most of the off-road bikes were then tuned by SWM. If it seems a strange situation that SWM should provide motors to a competitor then it should be remembered that Signor Sironi who owns SWM also has a half share in Moto Gori along with the company's founder Giancarlo Gori.